St. John's, Newfoundland--(Newsfile Corp. - January 31, 2019) - Sokoman Iron Corp. (TSXV: SIC) ('Sokoman' or 'the Company') is pleased to announce that it has received all outstanding assay results for drill holes completed during the Phase 2 diamond drill program on the high-grade Moosehead Gold Project in north-central Newfoundland. The results are mainly from the Western Trend and historical targets up to 1 kilometre to the north and south of the Western Trend. The results also include assays from infill sampling from MH-18-39, and two holes not previously reported on from the Eastern Trend, MH-18-37 and 40. All core intersections from the Phase 2 drilling that were thought to have intersected high-grade mineralization based on quartz veining and visible gold sightings, were cut and rush assayed in December 2018 with results reported in the December 14, 2018 News Release. The full results are in a table appended to this news release. The Company is also pleased to announce that the Phase 3 diamond drilling will begin immediately and will focus on targets identified from a preliminary structural evaluation recently completed on the Eastern Trend. While the ice thickness on North Pond is currently not sufficient to support drilling equipment, extensions to the Eastern Trend can be tested by land-based drilling. In the meantime, the Company will continue with efforts to increase ice thicknesses, by flooding, at North Pond. Additional sampling in MH-18-39 immediately up-hole from the previously reported 5.10m high-grade section returned low grade gold values for an additional 3.95m including 1.40m @ 1.34 g/t Au. Sampling immediately downhole from the 5.10 high grade intercept returned only anomalous gold values to a maximum of 94 ppb. The revised intersection is: 9.05m @70.29 g/t Au from 75.45m downhole. Results from holes MH-18-37 and 40 suggest they did not properly intersect the plane of the newly recognized Eastern Trend shear zone. The Shear Zone is a large-scale, kilometric, structure of uncertain regional strike trend beyond the small drilled area and with possible links to the regional faults/thrusts bounding the gold district. This may be the most important structure in the local district, and the central axis of the Au system. Strike continuations of this structure are unknown and undrilled. As well as along the strike continuation, the best potential may be at depth where the structure roots into the regional NE striking thrust faults. The shear zone has two internal shear and fabric elements, a 20-30 degree East dip and a 50-70 degree East dip, in an overall 45 to 50 degree dipping zone. The internal shear pattern may locally control the Au grade whilst the geometry of the shear sets suggests that structural ore shoots within the plane of the shear zone may be shallow plunging with lower grade zones between them. Timothy Froude, P. Geo. and President and CEO of Sokoman Iron states; "The 7,643 metre, thirty-five hole, Phase 2 drilling campaign has expanded the footprint of both the Western and Eastern Trends, with key step-outs to the North and South of the Eastern Trend discovery hole, MH-18-01, as well as in the up-dip direction with the zone remaining open. In addition, the preliminary report from Earth Tectonics presents a positive view of the Eastern Trend mineralization and its potential, portions of which can be drilled from the east side of North Pond thus lessening the dependence on an "ice based" platform. The surface projection of the newly defined shear zone lies along the western shoreline of North Pond where previous workers have reported clusters of visible gold bearing quartz float assaying from 19 to 149 g/t Au, supporting the interpreted projection of the shear zone. Land-based drilling will commence immediately and will use the structural report for drill targeting in addition to high priority areas to the south. Once ice conditions are deemed safe, drilling from the ice surface to test other sections of the Eastern Zone will begin using a second rig." 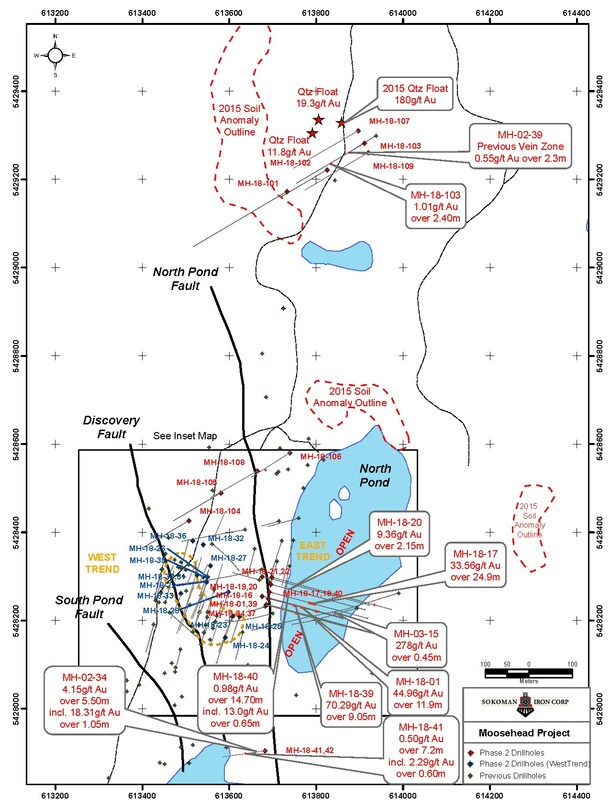 Phase 2 drilling also resulted in the discovery of a potentially significant new zone of gold mineralization in MH-10-103, located approximately 1 km to the north of the Eastern Trend in the general vicinity of a cluster of historical quartz vein boulders that were drill tested by previous operators in 2002. 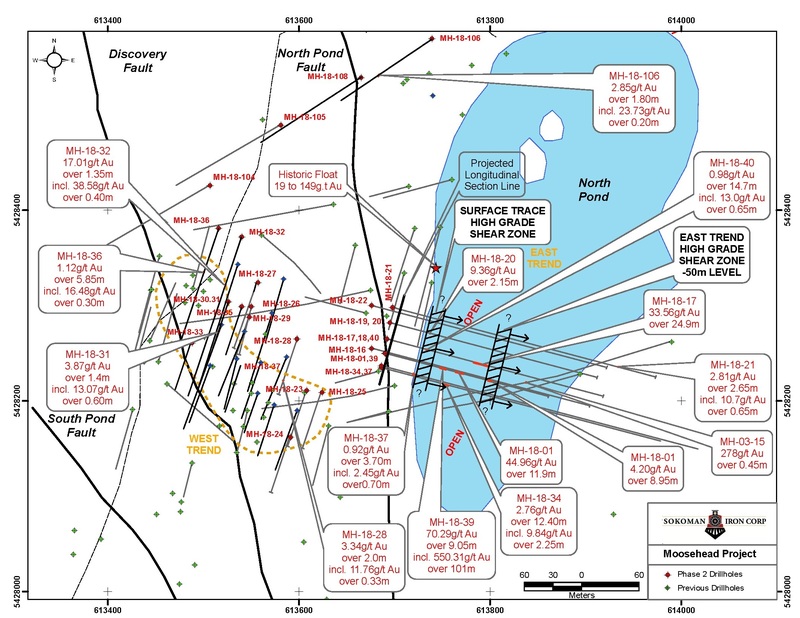 Historical drill hole MH-02-39 reported an eight metre zone of quartz breccia and veining with assays of 552 ppb Au over 2.3 m* in a broader zone of anomalous gold values. (*Values reported are historical in nature and not verified by Sokoman Iron Corp.) Previously reported MH-18-103, collared 30 metres ahead (west) of MH-02-39, intersected the brecciated zone, but continued beyond the termination of the 2002 drill hole and intersected a second, more strongly mineralized (3-5% pyrite/sphalerite/boulangerite + 1 speck of visible gold) vein zone over a 2.40 m core length, similar in appearance to the Western Trend (true thickness unknown). The interval returned an average grade of 1.01 g/t Au, lower than anticipated, but not unexpected given the nuggety nature of gold mineralization on the property. Additional drilling included two step-out holes MH-18-107 and 109, 25 m to the north and south respectively, of MH-18-103. Both holes intersected only anomalous gold values, however, the Company believes that the source of the high-grade float is local and will consider additional work in the area. Two holes (MH-18-41 and 42) have been drilled down-dip (25 and 40 m respectively) from historical hole MH-02-34 located 500 m to the south of the Eastern Trend intersections. 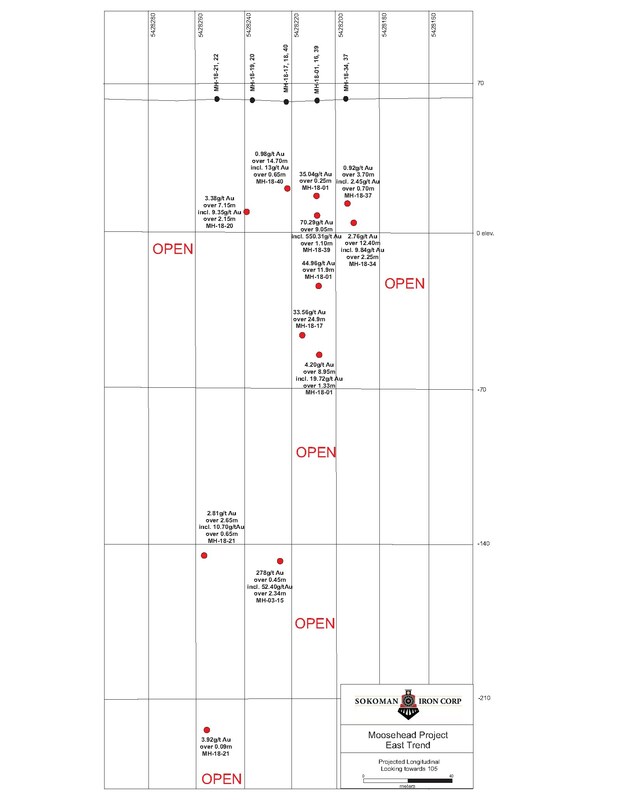 Historical hole MH-02-34 returned a 5.50 m interval (core length from 67.64 m down-hole) averaging 4.15 g/t Au, including 1.05 m at 18.31 g/t Au* (with 28 total specks of gold reported). MH-18-41 reported 4 specks of visible gold between 91.50 and 93.90 m down-hole and returned a 7.20 m section with two mineralized intervals assaying: 2.29 g/t Au over 0.60 m from 91.05m downhole, and 1.43 g/t Au over 1.10m from 93.70m downhole, again reflecting the unpredictability of visible gold (all core thicknesses, true thickness not known). The company intends to test other property wide high priority targets while evaluating results to date from areas already tested. *Values reported are historical in nature and not verified by Sokoman Iron Corp.
A total of 2148 samples, including duplicates, blanks and standards, have been submitted to Eastern Analytical Ltd. in Springdale, Newfoundland for gold and ICP analysis. Samples with possible visible gold were submitted for total pulp metallics and gravimetric finish. All other samples were analyzed by standard fire assay methods. Eastern Analytical is an accredited assay lab that conforms to requirements of ISO/IEC 17025. Total pulp metallic analysis is a result of a whole sample being crushed to -10 mesh and pulverized to 95% -150 mesh. The total sample is then weighed and screened 150 mesh. The +150 mesh fraction is fire assayed for Au, and a 30 g subsample of the -150 mesh fraction is fire assayed for Au. A calculated weighted average of total Au in the sample is reported as well. The Company included in the sample stream one blank and one industry approved standard for every twenty samples submitted, as well as random duplicates of selected samples. This is in addition to the in-house standard and duplicate policy of Eastern Analytical. Drilling services is being provided by the Diamond Drilling Division of Springdale Forest Resources Inc., a diversified natural resources-focused company based in Springdale, NL. The Company would also like to thank the Government of Newfoundland and Labrador for approving the Moosehead Phase 1 Program for 2018 JEA Funding. Sokoman Iron Corp. (TSXV: SIC) is a discovery-focused company with projects in Newfoundland & Labrador, Canada. Sokoman's primary focus is its portfolio of gold projects in Central Newfoundland. The Company also has interests in early-stage gold, base-metal and antimony projects in Newfoundland, as well as a 100% interest in the Iron Horse (Fe/V/REE) project in Western Labrador. Table of Results: Phase 2 Diamond Drilling Note: Core length intercepts reported are 50 to 100% of true thickness.